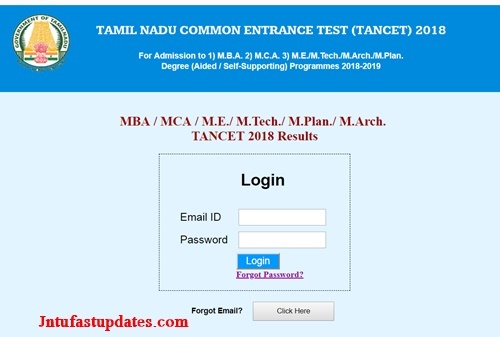 TANCET 2018 Results: Anna University has Declared Tamil Nadu CET (TANCET) 2018 Results at annauniv.edu. Candidates can download Mark Sheet from 13th June onwards. Earlier it has released notification and invited online applications for the Tamil Nadu Common Entrance Test (TANCET) 2018. A huge number of candidates who are looking for the admission into M.B.A, M.C.A and M.E/ M.Tech/ M.Arch degree programs applied and appeared for the examination. Candidates who had written the exam can check TANCET Results 2018 along with the mark sheet from the direct link provided below. Candidates who will qualify in the examination are eligible for the admissions based on the ranks they have obtained. Anna University is a technical university in Tamil Nadu, India. The main university campus is located in Guindy, Chennai. It was named after C N Annadurai, former Chief Minister of Tamil Nadu on 4 September 1978 . It became an affiliating university in 2001, absorbing all engineering colleges in Tamil Nadu. A Common Entrance Test namely Tamil Nadu Professional Courses Entrance Examination (TNPC EE) was used as a basis for admission to professional courses in the state until 2006. The university offers various courses in engineering and technology through its affiliated colleges and follows a dual semester system. This year it has released notification for the TANCET 2018 exam and the candidates who had written the examination can check the results from the official website. The Anna University, Tamil Nadu successfully conducted Tamil Nadu Common Entrance Test (TANCET) on 19th & 20th May 2018. A large number of candidates applied and appeared for the examination across various centers in Tamil Nadu. All the candidates who had written the exam are eagerly waiting for the results. Now, the wait is over. Anna University declared TANCET MBA/ MCA/ M.E/ M.Tech Results 2018. Candidates can check the results from the direct link provided below. Now tancet 2018 Result working Link activated below. 2. Applying for admission to the admitting authorities concerned. How to Check TANCET Results/ Mark sheet 2018? Click on TANCET Results 2018. Enter your Email ID and password in the provided fields. The TANCET Results along with marks sheet will appear on the screen. Stay tuned to this website. Servers down due to high volume of hits.We will update latest results, admit cards, answer keys here. Press CTRL+D to bookmark this page for easy navigation. 1.2 How to Check TANCET Results/ Mark sheet 2018?